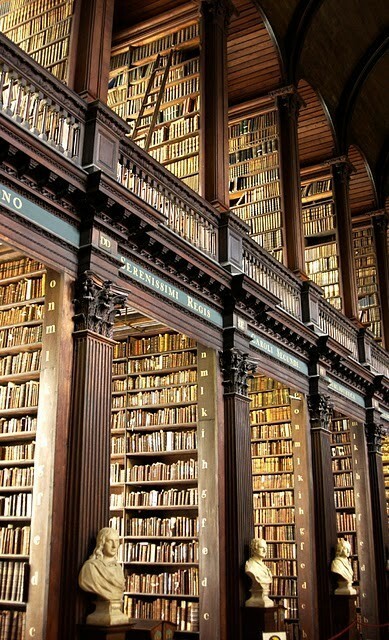 The library is also the permanent home to the famous Book of Kells. Two of the four volumes are on public display, one opened to a major decorated page and the other to a typical page of text. The volumes and pages shown are regularly changed. According to the Republic of Ireland's Copyright and Related Rights Act, 2000, the Library is entitled, along with the National Library of Ireland and the libraries of the National University of Ireland, the University of Limerick, and Dublin City University, to receive a copy of all works published in the Republic of Ireland. Also, as a result of the British Legal Deposit Libraries Act 2003, which continues a more ancient right dating from 1801, the Library is entitled, along with the British Library, the Bodleian Library at Oxford, Cambridge University Library, the National Library of Wales and the National Library of Scotland, to receive a copy on request of all works published in the United Kingdom.